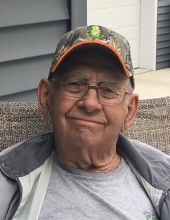 Norbert Deslauriers, age 88, of rural Canby, MN passed away on Friday, January 11, 2019 at the Johnson Memorial Hospital in Dawson, MN. Mass of Christian Burial will be 10:30am on Thursday, January 17th at St. Peters Catholic Church in Canby. Visitation will be 4 to 7pm on Wednesday, January 16th at the St. Peters Catholic Church in Canby with a 7pm prayer service and rosary to follow. Visitation will resume one hour prior to the service at the church. Burial with Military Honors will be at the St. Peters Catholic Cemetery in Canby. Houseman Funeral Home-Birk Chapel of Canby is entrusted with the arrangements. Family prefers memorials in lieu of flowers. Norbert George Deslauriers was born on April 17, 1930 in Slayton, MN to parents Elmer and Rosalia (Illg) Deslauriers. He was raised in the Currie, MN area on his family’s farm, and he attended Immaculate Heart of Mary School. He farmed alongside his father until he joined the United States Air Force and proudly served his country from 1947 – 1952 during the Korean War and the Berlin Air Lift. On April 15, 1952, Norbert married the love of his life, Phyllis Ann Ruppert at the Immaculate Heart of Mary Church in Currie, MN. To this union they were blessed with 15 children. They continued to live in the Currie area until 1956, which is when they relocated their family to a farm north of Canby. Norbert loved farming and teaching his children the value of hard work. When Norbert wasn’t busy farming, he enjoyed playing Cribbage, going to auctions, attending Canby wrestling matches and watching Walker, Texas Ranger on TV. Norbert and Phyllis enjoyed dancing on Saturday nights at the American Legion in Gary. He loved his family and spending time with them, especially his grandchildren and great-grandchildren where he was known as “Norbert the Great”. His faith and church were very important to him, as well as praying the rosary. Norbert was a member of St. Peter’s Catholic Church where he served on the pastoral church board, Knights of Columbus 3rd and 4th degree, Gary American Legion, Post 109, 40 & 8, Catholic Order of Foresters, Canby VFW and he was a Vita Plus Feed dealer for countless years. Grateful for having shared Norbert’s life are his 13 children: sons, Myron (Lenae) Canby, MN, Craig (Kirstian) Kilkenny, MN, Robert (friend, Darla Thompson), Canby, MN, and Donald (Tammy), New Ulm, MN; daughters, Renee Schwebach, Dumont, MN, Theresa Bly, Madison, MN, Jayne (Cal) Jeremiason, Marshall, MN, Madonna (Paul) Reckoff, Crestview, FL, Karen (Michael) Bekaert, Rapid City, SD, Sarah Deslauriers, Watertown, SD, Norberta Bekaert (fiancé, Leigh Mellendorf) Clear Lake, SD, Ann (Larry) Botten, Courtland, MN and Catherine (Perry) Fink, Canby, MN; 35 grandchildren; 25 great grandchildren; sister-in-law, JoEllyn Ruppert; several nieces and nephews; and his beloved dog, Dakota. He was preceded in death by his parents; wife, Phyllis; son, Joseph; daughter, Lucy; sons-in-law: James Schwebach and Thomas Bly; daughter-in-law, Julie Deslauriers; grandson, Steven Bly; sisters: Helen (Leo) Staples, Ethel (Floyd) Madson, Joyce (Marcel) Homan, Verdella (Tom) Slater; brother-in-law: Melvin Ruppert. To plant a tree in memory of Norbert Deslauriers, please visit our Tribute Store. Visitation will be 4 to 7pm on Wednesday, January 16th at the St. Peters Catholic Church in Canby with a 7pm prayer service and rosary to follow. Visitation will resume one hour prior to the service at the church. "Email Address" would like to share the life celebration of Norbert Deslauriers. Click on the "link" to go to share a favorite memory or leave a condolence message for the family.